On Saturday August 19, one week after the events of Charlottesville, Virginia, 40,000 people marched and rallied against an alt-right “free speech” protest in the Boston Common. Boston has demonstrated to the rest of the country a crucial lesson: A mass movement, with maximum participation and unity can defeat racism and the far right. The Boston “Free Speech Rally” had been in the works for over two months, and 25 people showed up. The anti-racist counter demonstration was announced less than a week prior and, according to Boston Police, drew over 40,000 people, a ration of 1600 to 1. To defeat the far right, we need the broadest possible participation in the movement. This means that labor unions, key progressive organizations such as the NAACP and Planned Parenthood, and leaders such as Bernie Sanders need to act as mobilizers. Several labor unions had contingents in the Boston march, including the Massachusetts Teachers Association, Boston Teachers Union, and SEIU 509, which represents a big step forward for the movement. More unions, such as SEIU 1199 and Unite Here Local 26, put out statements of support for the demonstration. The march was organized and led by members of Black Lives Matter Cambridge. The Socialist Contingent in Boston on August 19. 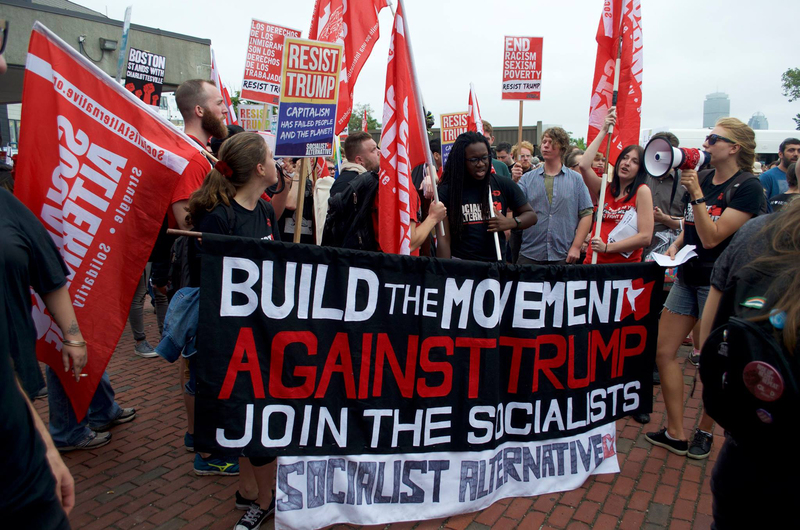 Immediately after the march reached the Common, 40 members of Socialist Alternative from Boston and Worcester split up and spread out to talk to people about the need to carry this momentum into building an ongoing movement. We talked with people about how capitalism needs racism to survive in order to keep the working class divided, and that to challenge racism most effectively we need to build a movement against racism and capitalism. The threat of racism, as well as coming from white supremacists, is institutionalized in Boston by cuts to public education and social services in the face of tax cuts and handouts to giant corporations like GE. The majority of housing being built are luxury condos that are out of reach for regular working people, especially people of color who are disproportionately low-wage earners. We handed out 5,000 flyers for a public meeting on Tuesday called “Socialism and the Struggle Against Racism and the Far Right.” We sold over 100 copies of our Socialist Alternative newspaper and raised over $1,000 in donations by selling buttons and posters! Previous articleWe Want You for Socialist Students! Next articleHow Can We Win Socialist Change?